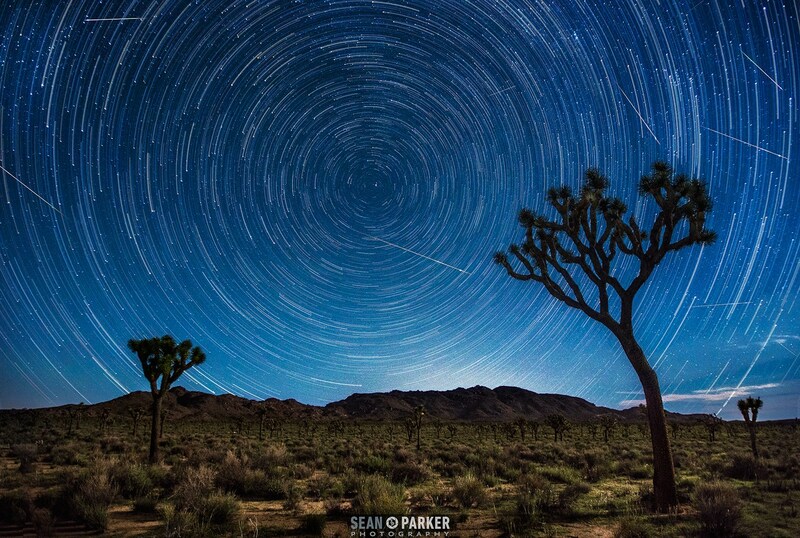 Image Credit & Copyright: Sean Parker. Still one of my all-time favorite meteor shower images. Thursday night, August 11, until dawn on Friday, August 12 will host the peak viewing hours for this year’s annual Perseids meteor shower. As with all meteor showers there’s an estimated viewing window aka; “active dates” which in this case run from mid-July to late August. Peak viewing however, is almost primarily a single given night through the following morning before dawn. This year’s peak hourly rates will be around 50-75 per hour and you will want to be looking in the general direction of Perseus in the north. This is a primarily Northern Hemisphere show but the big floodlight in the night sky (the Moon) will be in its waxing gibbous phase so it will already be up when the Sun sets and will likely diminish the show somewhat for most of the night. WHAT CAUSES THIS SHOWER? : As with all meteor showers; they’re created as Earth plows though a debris field left in space by a long past comet or asteroid. The parent body that causes this shower is listed in the data below. HOW MANY WILL I SEE? : Keep in mind predictions are just that, predictions based of past totals, performance and future forecasts so just because it says “X” per-hour you have to understand that meteor shower prediction is about as fickle as weather prediction. Also when you see “X” per-hour, that’s DARK SKY totals with the radiant point (where they’re coming from) directly overhead, 360 degree horizons and that’s if you catch every streak, including faint meteors. So your totals (like mine) will probably be half that if you’re viewing from your back yard and are within 30 min or so of a medium sized city. Probably half that yet again if the moon is out and larger than a small, few day young or old crescent. WHEN DO I LOOK? : Peak night is usually a given night and next morning with the “next morning” often being the absolute best time to watch. In fact the closer to morning twilight you can get, the better…..here’s why. If you view the solar system from “above” planets orbit the Sun in a counter clockwise motion and we also rotate in a counter clockwise motion. That means, just before your sunrise the Earth’s rotation has it pointed in the direction of travel of the Earth as it orbits the Sun and meteors are mere “bugs (or if you prefer; “snowflakes”) hitting the windshield” of Spaceship Earth as it plows through the debris field. WHERE DO I LOOK? : You will want to look in the direction of the radiant point of the shower for best results. The radiant point is where it appears that the meteors radiate from and is usually associated with the constellation they are named after. For example; the radiant point for the Orionids is the constellation of Orion. Just above his head or over his shoulders actually. Also the higher that the radiant point gets the better observing may become because meteors radiate out in all directions and most aren’t visible until they’re approximately 30 degrees or so from said radiant point. NOTE: Something to also take into consideration is where the constellation will be. For example; Perseus won’t start the night very high in the sky but through the night it will rise in the northeast and set in the northwest so just looking north should be just fine. For other, more non-polar showers this may be something to consider as the radiant point will move a great distance through the night. WHAT DO I NEED? : Well, as for seeing them….nothing. The most important things you need are a clear, dark sky, preferably with a nice wide open horizon with no Moon. In fact you really can’t use binoculars or telescopes for meteor showers because the streak is too long, too fast and you won’t be able to physically move your equipment into position in the about of time a streak takes to appear and burn out. Also just as a quick reference; first quarter moon rises around noon, is high overhead around sunset and sets around midnight. Full Moon rises around sunset is up all night (usually highest around midnight) and sets with sunrise. Third (last) quarter moon rises around midnight is high overhead around sunrise and sets around noon. These aren’t exact but pretty good gauges to use when trying to figure out when the moon will show up and or go away. THINGS TO CONSIDER: Weather and subsequently how you plan to dress for that weather can make or break a night of meteor shower watching. Red flashlights will help save your eyes because dark adaptation is a key in picking out the faint streaks you won’t be able to see after you just check your cell phone (which I’m always guilty of). Besides that you might want some good company, a chair, some blankets, bug spray, food and try not to land on any ant hills. ACTIVE DATES: Mid-July – Late-August, 2015. PEAK VIEWING: Night of Thursday, August 11 until the dawn of Friday, August 12. HOURLY RATE: Approximately 50-75 per-hour. MOON IMPACT = High! The waxing gibbous moon, 65% illuminated will already be up when the Sun sets and will remain well past midnight. VELOCITY: 40 miles per second. PARENT BODY: Comet 109P Swift-Tuttle. Image | This entry was posted in Astronomical Events, Astronomy (Learning), Astrophotography (Wide Field), Comets, Asteroids & Meteors and tagged Arizona, Astronomy, Astrophotography, DanSpace77, Meteor, Meteor Shower, Meteors, Perseids, Sean Parker, Space. Bookmark the permalink.